Arizona’s SB 1070 is set to go into effect this Thursday, July 29, and it brings a variety of reactions from Latin America leaders. An Arizona Republic poll found 62 percent support allowing illegal immigrants who are living here now to remain in the country if they have a job and no criminal record. Seventy-three percent of those polled favor a program to identify and put to work foreign workers when needed. This is the guest-worker component of comprehensive reform. It reflects the reality that our nation needs migrant workers. 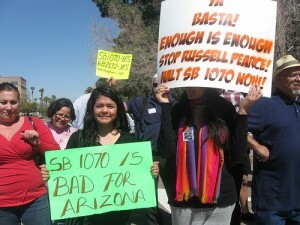 The same poll found 55 percent of Arizonans support SB 1070. Support for SB 1070 reflects bone-deep frustration with a broken system that brought death to our deserts and drop houses to our neighborhoods. The Republic’s poll also shows people understand that controlling the border means controlling access to jobs. The vast majority of illegal border crossers come here to work – not collect benefits or ferry drugs. It will take years to resolve the court battles and sort out the social and political implications of Arizona’s misbegotten immigration law. But public opinion is clear right now. The people of Arizona understand the complexity of a problem that politicians shrink down to bumper-sticker banality. One of the poll shows that people want comprehensive immigration reform, despite years of efforts to discredit the idea.